Just found a few sets in our warehouse - limited supply ~ Get one today! Our Miniature Gnome collections have always been great sellers, so why not offer the full collection of Gnomeo & Juliet characters in a miniature set! Each 12-pack includes all 10 characters in the image shown above. (Gnomeo, Juliet, Nanette, Tybalt, Paris, Lady Blueberry, Shroom, Benny, Goons & Bunnies) Because they are featured in multiples in the movie, you get 2 Goons and 2 Bunnies in the set! Each character is approx 3-4" tall, made of a durable poly-resin, and will be able to stand alone in your garden, in your planters, or even on your office desk. 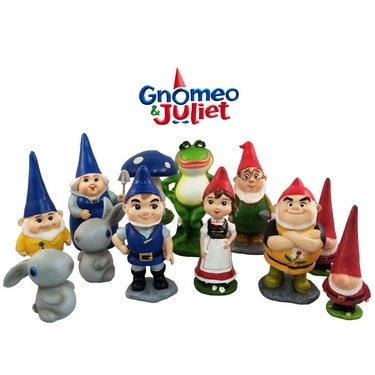 Tons a fun, we're thrilled to offer this Miniature Gnomeo & Juliet 12-pack! Recreate the love story in your home, office and garden! We love all the Gnomeo & Juliet characters and this Miniature Gnome Set is simply awesome! This is the same popular set we sold in 2013. To our delighted surprise, during a recent warehouse clean-up, we found a handful of cases! So they are back again with a very limited supply. Get your set today!